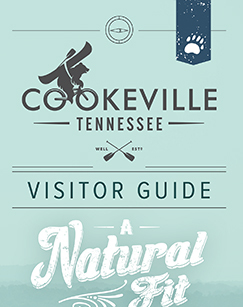 If outdoor adventure is your thing, then Cookeville is the place for you! Hiking, waterfalls and state parks seem to be around every corner. Each and every waterfall or trail offers its own unique and breathtaking views. So whether you’re looking for a leisure walking path or an advanced hike, there is definitely an adventure that will be A Natural Fit for you! Take in the spectacular overlook of the Calfkiller River and Stamps Hollow. Legend has it that Native Americans gathered honey from hives underneath the cliff. Cane Creek Park & Recreation Area is a 262-acre regional park. Popular among dog-walkers and fishermen, the park’s centerpiece, Cane Creek Lake, is a 56-acre lake, surrounded by paved walking/jogging paths, picnic shelters, playground equipment, basketball court, volleyball court, 18-hole disc golf course, mountain bike trail, rec center and sportsplex. The lake offers two fishing piers, a boat ramp (no gas motors), and paddle boat rentals. Well-stocked with rainbow trout, large-mouth bass, bluegill, crappie, carp and catfish, Cane Creek Lake is a fishing favorite (Note: Tennessee fishing laws do apply). The 35-acre City Lake Natural Area is located on Bridgeway Drive and is preserved in its natural state, with some improvements to help accessibility. The park is a favorite area of fishermen as they can catch catfish, bass and bream. Cookeville’s first water treatment facility was constructed here. Dogwood Park is a green oasis in the downtown area across from the City Municipal Building. It’s a great place for lunchtime picnics. The Performance Pavilion is located in this park. Dogwood park is also home to a beautiful interactive fountain which flows daily throughout the spring/summer season. The Heart of the City Playground, the area’s only all-inclusive, fully-accessible playground, was also built inside the park in late 2015. This park is adjacent to Park View Pool at 570 Scott Avenue. Playground equipment is fully accessible and has a picnic shelter with tables. Chosen for its two springs and its central spot in the new county of Putnam, Cookeville was chartered in 1856 as the county seat and named for Richard Fielding Cooke, who was instrumental in founding the county in 1854. The routing of the Nashville & Knoxville Railroad (later called the Tennessee Central Railroad) through Cookeville in 1890 greatly stimulated its prosperity. The rails carried out products of farms and forests and brought in manufactured goods. After a depot was built west of the square, businesses and residences sprang up nearby, giving Cookeville two commercial districts, the WestSide and the Square. On the corner of South Maple, Stevens St. & Elm Ave. this park is adjacent to Capshaw Elementay School. This park is a natural area with an easy walking trail and picnic tables. A beautiful little park in the heart of town which features picnic tables, two walking trails, a small amphitheater for lectures and educational uses, a stone council ring for scout meetings and nature groups and a gazebo with an informational kiosk which centers on our city’s system of sink holes. Pickett State Park lies within the 19,200-acre Pickett State Forest, and is adjacent to the massive 120,000-acre Big South Fork National River and Recreation Area. In 1933, the Stearns Coal and Lumber Company donated nearly 12,000 acres of land to the State of Tennessee to be developed as a forest recreational area. Initial development of the area by the Civilian Conservation Corps (CCC) occurred between 1934 through 1942. The CCC constructed hiking trails, five rustic cabins, a recreation lodge, a ranger station and a 12-acre lake. The park memorializes and preserves the unique work of the CCC who first developed the park. It's hard to imagine a prettier place for a rail-trail. The emerging 4-mile Tennessee Central Heritage Rail Trail winds across the high plains of central Tennessee between Cookeville and Algood. Excitement is building for the new recreational amenity, which will be unique to these communities in a region that already counts itself lucky with gorges, waterfalls, caves, rocky bluffs and the Cumberland Mountains above it all. The trail opened in September of 2016. This park is located at 186 South Walnut Avenue, immediately behind the Senior Citizens Center. This passive park contains a walking trail, picnic tables and a gazebo.